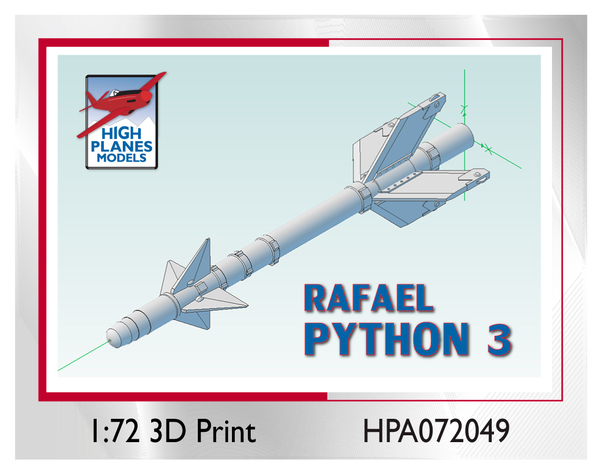 The Rafael Python 3 is an all aspect, infra-red third generation air to air missile. The first reported use with the Israeli Air Force was in 1979 and has proved to be a very successful weapon. It was exported widely, and is known in South African Air Force as the V3S Snake and the Chinese PLAAF as the PL-8. Large numbers have been produced, and it has been used by Bolivia, Brazil, Chile, the People's Republic of China (PL-8), Ecuador, Israel, Romania and South Africa (V3S Snake). It is compatible with the LAU-7 family of launch rails, and has been used on combat by Israel and Ecuador. It has been used on many Mirage III derivatives, Mirage F.1, F-15 Eagle, F-5 Tiger II, IAR-93 Soim, Embraer EMB 314 Super Tucano, Shenyang J-8 Finback, J-11 Flanker & Chengdu J-10 (PL-8). It is cleared for use on the F-16 Fighting Falcon but actual use seems rare.